We are looking at old problems and issues in delightfully different ways today. We can have a-ha moments now, seeing things, and especially relationships, in a brand new light. Ideas coming to us now can be significant and/or long-term. If you’re going to write ideas down, this is the time to do so, as we may not yet see the significance of what we’re discovering and birthing. There is enthusiasm in our conversations, and excitement about our interests and discoveries, but there is also a lot of imagination. The Moon is in Cancer until 6:29 AM EDT. The Moon is in Leo from 6:29 AM EDT forward (until October 18th at 7:09 PM). The Moon is void until 6:29 AM EDT (no major beginnings during the void period). 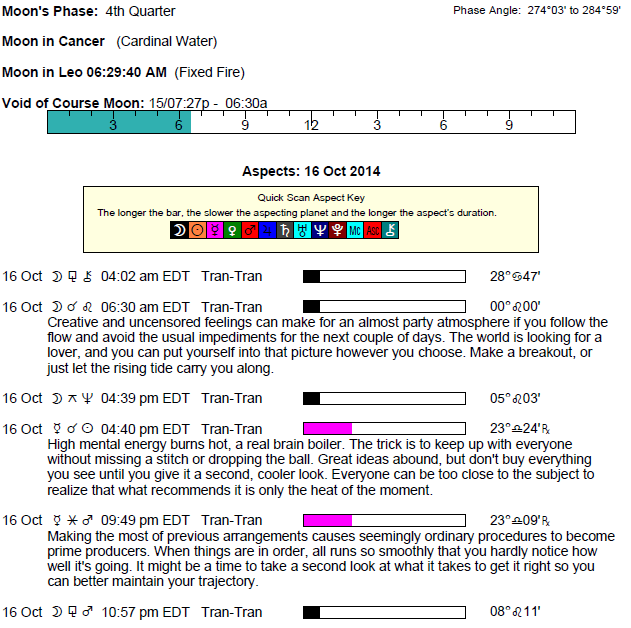 The Moon is waning, and is in its Last Quarter phase. Mercury conjunct the Sun today at 23 degrees Libra – Mercury’s inferior conjunction. This is very much like the energies of a New Moon, except along the lines of Mercury: it’s about the birth of significant new ideas. Illumination of a relationship matter can come now, although you won’t have all the answers just yet. There can be talk of a social event or a person you used to know, and the emphasis is on looking at the past in a new light. Communications with or about a partner can be very significant. This is a time for seeing a partner or a close friendship from an entirely new angle, and you can feel quite enthusiastic about the whole process. It’s also a time when counseling and advice can figure strongly. Revisiting an old relationship may be a question – the answer is not straightforward as it depends on why it’s in the past in the first place. Certainly you’re thinking about ways to expand your life experience beyond the routine, and you can be very excited about your prospects, new insights, and mind-expanding theories today. You’re inclined to share! You could be looking at a health or work matter in a totally new way today. Ideas that come to you now can have significance going forward. You want to sort things out, put things into order, and make sense of everything right now, and this is especially the case when it comes to your thoughts. You could be gathering information to help out/support others, and in the process, learn something important for yourself. Try not to succumb to pressure to come to a decision or conclusion when it’s simply too soon. Coming at problems from a fresh angle can be very helpful now. Motivation is strong today. There can be a big discovery today about a romantic or creative matter. Something about the past can be seen in a new light, and this helps you to move forward! There is a recycling experience going on when it comes to ideas – by taking a new look at old ideas, something new and fresh emerges. There may be the reappearance of an old lover or friend, whether it’s only in thought or it’s in the flesh, and this can jumpstart new ways of thinking about your life. There could be “new” opportunities arising from old ones. What you do with these is up to you, but the experience is likely to propel you forward. You have more persuasive power and verbal “punch”, so be careful with that. You also have stronger personal presence today. Romantic intensity – the pleasant kind – can be part of the picture today and in the coming few days. You can be especially reasonable and objective in your communications today. You are inclined to analyze, or reminisce about, the past, particularly about or with family. You may spend some time trying to draw conclusions or to get solid answers about a family, past, or home-related matter. Review matters but don’t push them. An idea that comes out of these thoughts or conversations can be defining and important, and is likely to play out over the coming months. This is in fact an important time in general for birthing ideas that can be part of your life in the long term. What you, and others, say today packs more punch than usual, so it’s wise to communicate with intent, but it’s also very important to open yourself up to ideas that are normally rationalized away. You can feel especially passionate about an idea now, and the desire to revise and renew is strong. Ideas you have revolving around learning, schooling, siblings, communications, mental interests, and connections can be a little raw today, but can spark a long-term pursuit, interest, or attitude. There is a birthing process of ideas happening today, and it’s important to be open to entertaining whatever comes to mind before rationalizing things away! This is a time for reviewing recent decisions and ideas and coming at them with new energy and perspective. It’s a strong time for insights, so jot down whatever you don’t communicate or put into motion. 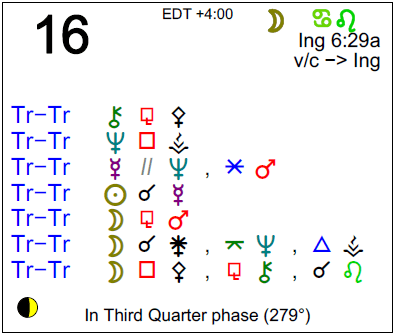 The Moon enters your sign this morning, and there can be a re-awakening of emotions. This should be a pleasurable, warm, and expansive time for you. Information or ideas coming to you today are likely significant for you in the long term, and this is especially the case when it comes to money matters, valuables, personal possessions, and business in general. This can be a time for mining ideas from a new way of looking at the past or past matters. This is a time for gathering, processing, reviewing, and recycling information. For some of you, money can come in from unexpected or forgotten sources, a review of your records brings up something valuable, or somebody could return an item that you had given up on. Others tend to truly listen to what you have to say today, so be sure you’re speaking and writing with intent. This is an important day for taking stock of recent events in your life, dreaming up new ideas to implement down the road, and contemplating what kind of changes you’d like to make. Take the time to jot down ideas that come to you, as they can be very significant in the long term, even if at the moment there doesn’t seem much to them. What you communicate today has more impact than usual. While people are more inclined to listen, they aren’t necessarily understanding your intent, so be as clear as possible. A different take on a past matter can give birth to a new or improved idea. It’s in its raw stages for now. There is more energy in your conversations and information interchanges. Take note of information and ideas coming to you today, especially from dreams, of both the night and day variety, and from deep within. You could be talking of a personal or private issue, reminiscing about the past, or dealing with the revealing of a secret. There can be a new understanding of a past matter as you are coming at things from a different angle, or as new information emerges. This can be a day when an important blank is filled, and you have an “aha” moment. Interactions can be passionate and energetic today. There is more sensitivity to the goings-on in your immediate environment today, as well as increased awareness of words spoken and how they seem to be received. Others are noticing you, and you have a little more personal impact than usual. As such, it’s important to choose your words accordingly. Friends can be especially helpful and can provide valuable feedback. This is an important day for processing and recycling recent ideas. A new understanding of an old matter might be reached now, and this is particularly the case when it comes to friendships. Pay close attention to ideas that come to you now, as they have long-term potential. Connecting with a partner in a creative way can occur now – there can be intrigue and mutual interest. This is a time when you might come to an important conclusion or think up a doable idea regarding a career or public move. Some of you may be prompted to speak on a matter professionally or publicly, but for many others, you are communicating with more punch and impact. As a result, it’s important to choose words carefully and wisely, and to be very clear. It’s a good time to review business and image-related matters with someone you trust, perhaps in a position of authority, such as a parent or boss. You might also want to brainstorm or tap into your own intuition in order to examine the past, and birth new or recycled and rejuvenated ideas in the process. You are bringing new energy to matters of the past, and looking at things from a different perspective. Ideas coming suddenly and intuitively to you today and tomorrow should receive special attention as they’re likely to have significance for you in the long term. You may be reviewing, editing, going over, and refining past ideas and beliefs with a new perspective or different point of reference. Interactions and communications can be especially important and relevant, and perhaps inspirational, setting you along a new, more enlightened path. Do your best not to force things now. Rather, take a step back and let your intuition do the work. While it’s a day in which the mind figures more strongly than the heart, nevertheless there can be some kind and caring moments with a special friend or partner. There is a strong tendency to focus on personal and intimate matters from an intellectual, analytic perspective today. Conversations or your own personal analysis can lead to special insight into an intimate relationship and intimate needs. You could take a new look at financial plans or arrangements. Money owed or due could be an issue. Going over a personal issue from the past can be in strong focus now. Ideas coming to you today can be important ones with long-term significance. There can be interesting discoveries. You might be investigating someone, or someone could be looking into your past. There can be a new attitude emerging today that sets you on a new path. If Your Birthday is October 16th, the year ahead should be an exciting year of discovery, making connections, coming up with new ideas, and enjoying close relationships. 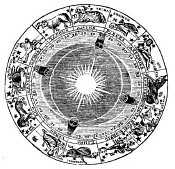 If Today is Your Birthday full horoscope here. You have difficulty expressing your feelings in relationships. You feel you cannot relax and be yourself when with your loved ones. Once you have learnt to reveal your feelings in a loving manner you will develop an understanding of relationships. It is time for you to leave behind your past inhibitions and truly express yourself in this life-time. You will find that events in life will force you to come to terms with your identity in order to express your fullest potential. Moon 06° Capricorn 03' 15"
Mercury 09° Aries 38' 27"